Image from Reap What You Sew. Nicole Mackinlay-Hahn, the filmmaker behind the Christie's Green Auction PSA, is better known for her work connecting the consumer to the product sources, the people who create these products and their lives, through video documentation. Her Mirror/Africa project, an interactive art installation that was featured at Barneys in 2008, told stories of the lives of people along the production line in short video clips, all of which help paint a larger picture of where we get our goods from and the lives affected by the process of constant consumption of clothing and fashion. Not only is her client list filled with organizations with sustainability in mind, like Edun and yours truly, her own documentation process is low impact, preferring to not travel with a crew, hiring locals to help her navigate the area, and creating personal relationships with the subjects of her videos. 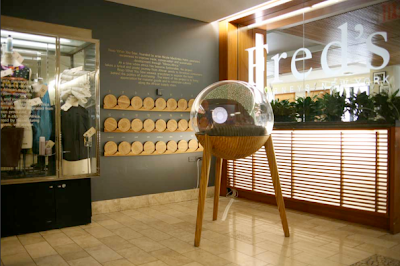 Check out this video of reactions from shoppers at Barneys interacting with her installation here and Eco Salon's most recent Q&A with her here!